Implementing Culture and being a great leader is tough, we know. What many have believed for a long time was the “Great Man Theory”. Well, there’s a lot left to be desired with this theory. This theory basically states that due to genetics and birthright you are or are not a great leader. We don’t believe that way, we believe that anyone can harness the power of compassionate and servant leadership while catering to the underlying purpose of business, to make the business grow. Engagement in employees, doesn’t happen overnight, it’s a long systematic process of earning/building trust and implementing a great environment for employees to thrive. It also doesn’t “un-happen” overnight either. If you’ve got a disengaged workforce, it’s most likely because of systematic de-motivation over a period of time. Motivation - the reason or reasons one has for acting or behaving in a particular way. Employee Engagement - the emotional commitment the employee has to the organization and its goals. This emotional commitment means engaged employees actually care about their work and their company. Disengaged Worker - employees who are unhappy at work and do not feel challenged or otherwise “engaged”. These workers fit the stereotypical clock in, work, clock out mentality with little regard or see no advantage to go above and beyond. Actively Disengaged Worker - Actively disengaged employees are defined as employees who aren't just unhappy at work; they are busy acting out their unhappiness. Every day, these workers undermine what their engaged co-workers accomplish. Mastery - comprehensive knowledge or skill in a subject or accomplishment. control or superiority over someone or something. Zone of Proximal Development - an area where an employee may perform a task with guidance in order to develop new skills or learn new material. This “area” sits between what the worker can do without guidance, and what the worker cannot do with or without guidance. Goals - an idea of the future or desired result that a person or a group of people envisions, plans and commits to achieve. People endeavor to reach goals within a finite time by setting deadlines. F.A.S.T. Feedback - Frequent, Accurate, Specific and Timely feedback on activity by your employees. Whether the behavior is good or bad, feedback using this method increases engagement and productivity by showing that YOU are engaged in the process, as well as showing the way that activities should be performed with positive reinforcement and corrective constructive conversations in the instance of a missed goal. Purpose - the reason for which something is done or created or for which something exists. Have as one’s intention or objective. Reward - a thing given in recognition of one's service, effort, or achievement. Results Oriented Work Environment (ROWE) - a human resource management strategy co-created by Jody Thompson and Cali Ressler wherein employees are paid for results (output) rather than the number of hours worked. Extrinsic - not part of the essential nature of someone or something; coming or operating from outside. Type X - Extrinsic Motivation, the basis of Motivation 2.0. Directed behavior from outside forces of positive and negative reinforcement. Centralized Management - All decisions are made by a centralized person or manager. Work may be performed by employees, but changes, customer care, and other non-algorithmic tasks must be performed by a designated decision maker. Decentralized Management - Business Decisions are pushed to the lowest possible decision maker, including employees that typically perform algorithmic tasks. Leader-Member Exchange Theory (LMX) - a relationship-based approach to leadership that focuses on the two-way relationship between leaders and followers. Autonomy - freedom from external control or influence; independence. Cross Training - Training multiple employees, in roles not typically included in their job description in order for all employees to be able to do most if not all roles at any given time. Cross training helps with continuity in the event of an absence, and removes the “Silo” atmosphere from departmental separations by exposing someone to processes they may not have previously understood the complexities of. Dependence - the state of relying on or needing someone or something for aid, support, or the like. In the office, Dependance can be a detriment in the event of an absent, occupied, disengaged, or actively-disengaged worker. Flat Organization - an organization structure with few or no levels of management between management and staff level employees. The flat organization supervises employees less while promoting their increased involvement in the decision-making process. Hierarchical Organization - an organizational structure where every entity in the organization, except one, is subordinate to a single other entity. This arrangement is a form of a hierarchy. What is engaged? What does that look like and what does it mean to be engaged? On the large scale, it looks like productivity at a high level. At the microscopic level, it looks like employees that want to give their all, they aren’t afraid of coming up with creative ideas to improve their (and the team’s) productivity. During meetings, engaged members of the team actively put forth great ideas. They’re not stifled by Management and can feel free to take action, as opposed to asking for permission. Things actually get done. Disengaged are those workers that come to contribute only what the absolutely have to. They’re the employees that clock in, pursue their tasks, and then clock out at the end of the day, without doing anything outside of the scope of essential tasks. These people can be heard saying “it’s not my job to do that” and will turn away or avoid a client when it’s their turn to go on break in 30 seconds. These team members do not speak up or put forth ideas during meetings. Actively Disengaged, are workers that are a true detriment to your team. They’re sometimes called “Toxic” because they are set on poisoning your team’s mind, and “Drilling Holes” in the boat. They often have cynical attitudes toward management and other team members. As you can imagine, there are benefits of an engaged workforce and detriments of having a disengaged or actively disengaged employee or set of employees. Engaged employees increase revenue, they decrease overhead expenses, and they outperform disengaged and actively disengaged workers by a long shot. I couldn’t do a better job than this engagement video - it’s probably the best tool in teaching about engagement. People are all different with different internal motivators. Some are artistic, some mathematical. Some Free Spirited, and some are rigidly adherent to a routine and schedule. There are all sorts of personality tests that will define what people’s “brain” is doing, but the basics of motivation can be defined fairly simply here and then in more detail in Daniel Pink’s Drive: a surprising Truth about what motivates us. The early days of motivation were basic Physiological needs, and safety needs. As work became commoditized and economies began to develop, those needs were met with basic hourly labor and less of a concern for 20th century work. This Motivation still prevails in 3rd, 4th, and 5th world cultures. Late 19th Century and early 20th Century, method of motivation for the industrial age. Employees Seek rewards while avoiding punishment. In order to cater to this mentality, a structure must be put in place by the Management. These rewards and punishments can be as low on the hierarchy as taking away pay by separating employment and giving bonuses, putting the physiological needs back on the table, and as high on the hierarchy as esteem needs by praising or shaming. Takes the basic needs out of the equation. Once the employee is secure in those needs they can focus on Purpose, Mastery, and Autonomy. These meaningful thought processes to each person ensure an engaged workforce because they’re completing tasks they’re in control of and making decisions they have the power to. They’re independent entities working toward a common company goal. This includes more of an Intrinsic Motivator or TYPE I personality. These types of people are very motivated by having the purpose, autonomy, and mastery. They have been given Autonomy of Time, Task, Team, and Technique to get their job done. Think about your team, as much as you would like the ideal environment of treating all members of your team the same, that assumption that implies you treat all of them in a collective way is most likely false. Using an average leadership style for all members of your team would leave some lacking guidance while others would be overwhelmed by your intrusion into their autonomy. You, nor your managers, act this way (more than likely). With LMX a series of vertical dyads annotate relationships between the leader and the subordinate. Each leader interacts “down” with the subordinate, whereas the subordinate also interacts “up” with the leader. Each relationship is denoted with a vertical Dyad. Understanding that each Leader has an individual relationship with each subordinate is important. Once you’ve established this thought, you can start to understand and elaborate on the description of individual relationships. Who do you interact more with? This includes both positive and negative reinforcement. Who doesn't get attention from you at all? Which members of your team return interaction and which do not? Within organizational work units (most small businesses are about the size of a work unit even if they have drastically different departmental roles) subordinates become part of an “in-group” or “out-group”. Personality and other characteristics play a key role in determining this standing. Membership in one group or the other is dependent on how subordinates involve themselves with the leader. Subordinates that are willing to involve themselves in more responsibility become part of the “in-group” whereas those who do not, typically become part of the “out-group”. You will find a moderate to strong correlation between “in-group” and “engaged” workers, and the converse “out-group” and “disengaged” workers. Denoted in the illustration - Leaders that engage with subordinates (denoted with a +3) cyclically receive a positive engagement in return. employees that are engaged by leadership (preferably using FAST feedback) are more likely to take on more responsibility and be more proactive, and productive. Out-group members don’t go above and beyond to try and “Impress” the leader, and those typically do not, in return, get in the good graces of the leader. The big debate on how to interact here is based on preferences of leaders and data from the Pareto Principle. Pareto refers to about 20% of your workforce is doing 80% of the work. Logically, this results in 80% of your workforce only contributing 20% to your bottom line. You could probably triplicate all 3 of these principles together. There are studies that show that you will always have that disengaged, out-group bunch of employees. Do you start the cycle of pushing leadership on a few of them and try to get them into the cycle of In-group engaged behavior, or do you just let them be? It’s probably more of a personality question. If you engaged this individual, would they return the engagement? How can you motivate this particular out-group individual to be part of the in-group? We used to (and I still do) call this “drinking the kool-aid” - Some people never will, they’ll always be introverted personalities that have a “buck the system” attitude. Sometimes the best thing to do with them is to let them be and just understand that every business has them. The overarching thought is that you’ll get more productivity if you have 30% doing more work - but is it worth the effort to bring them into the in-group? In this model, leadership is “implemented” dependent on the subordinate’s level of competence, and commitment. The competence and commitment are typically tenure and relationship based. It’s also very task based. This isn’t necessarily how you would treat someone All of the time, but rather how they are to be lead based on an individual and the task in front of them. A leader must evaluate the employee and assess how competent and committed they are to perform a given task. Matching the leadership style to the person’s competence and commitment of the subordinates is the basis of this technique. 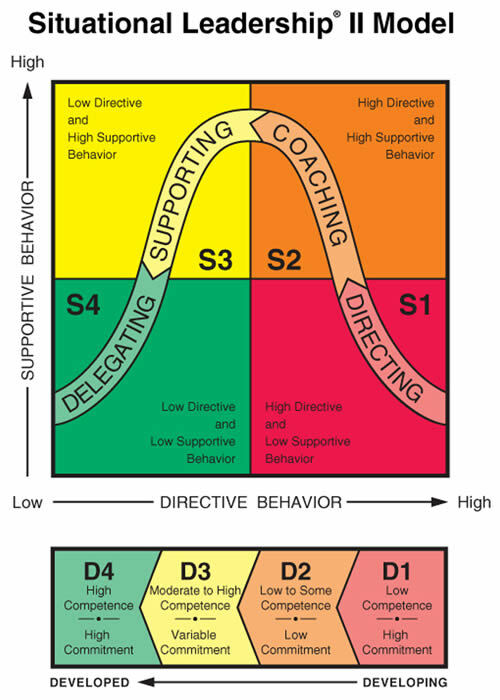 Development level of subordinates is the degree to which subordinates have the competence and commitment necessary to accompish a given task or activity. Has the person mastered the skills to do a specific task and do they have a positive attitude regarding the task? (Blanchard et al., 1985). 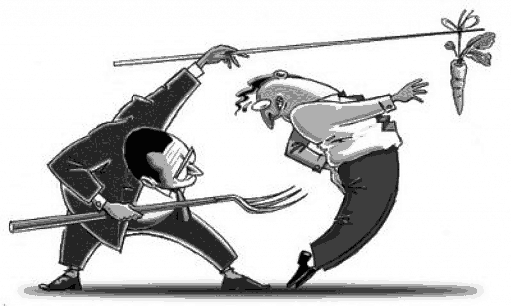 What task are subordinates being asked to perform? How complex is the task? Are the subordinates sufficiently skilled to accomplish the task? Do they have the desire to complete the job once they start it? Placing each task and employee on the “matrix” above would determine what role the leader should take. An inexperienced but motivated new employee would fall in the D1- Level and should be lead in S1, where the leader would have a heavy involvement in direction of the task, but a lower role in motivating the already driven employee. Similarly - a seasoned veteran maybe just needs a task delegated to them, they know how to perform the task, and they have a high level of motivation to do so. These two models are important techniques to look at the interaction between employees and leaders with the goal of motivation and keeping the employees engaged. Although there are many leadership techniques to actually implement tasks at them micro level, these two stick out as motivational and fit within the topic of culture for this module. Implementing a decentralized work environment begins with understanding what centralized work environment is, and similarly to a 12 step program, admitting that you are implementing that antiquated hierarchical system. Hierarchical organizations and Hierarchical decision trees are not the same thing. There are no organizations that have zero hierarchy, nor should there be. What does exist is strategic decision making hierarchy that allows the lowest person on the totem to have autonomy over certain decisions without needing to ask for a judgement from a superior in the hierarchy. A great example of this is YUM! foods, better known as the conglomerate that owns Pizza Hut, Taco Bell, and KFC. They have a company wide policy that allows ALL employees $5.00 in discretional spending in order to please a client. For example, a client’s order is incorrect, the employee has $5 to spend to remedy the situation immediately without permission from a manager. Similarly - we implemented a policy at one of the companies I worked for where the supervisory management could completely direct any project up to $25,000 without any managerial supervision, any particular purchase within that project did not need the signature of a manager. The idea is that they simply don’t care, they’ve got “more important things to deal with” such as a $37,000 single part purchase for an industrial engineering project. That’s kind of important to get it right, the right part, the right dimensions, the right materials, the right tensile strength, and many more engineering factors. If a supervisor needed to spend $300 on some engine coolant (yeah big engines) for a project, the management has the confidence in that supervisor to make the right decision and the responsibility to be “top cover” when something goes awry. The supervisor should not be afraid of repercussions, they have a responsibility to make the right decision and the ability, knowlege, and motivation to do so. A decentralized governance is only viable if the team is motivated to perform at a high level. Decentralized leadership should coincide with a highly engaged workforce. Depending on certain employees, or equipment can be detrimental. Having valuable employees is truly great, but when they’re gone they can really hurt your bottom line. Training and cross training should be a goal for everyone in your organization. it’s a multiple fold strategy to include the factor of motivation. Improved employee awareness of organization's roles and functions. Increased opportunities for employee advancement. Opportunity to strengthen customer support with more knowledgeable employees. Ability to keep employees motivated and "fresh" through assignment rotation. Potentially reduced absenteeism and employee turnover. Increased ability for managers to evaluate employees across an array of roles. Cross training prevents a lot of “bad”, and creates an additional intrinsic motivation by employees by continuing their curiosity and learning of other roles. Depending on one person to do a single job, is ok for the role they are the best at, however, you should always keep a backup, and train others because they will now understand the complexities of the role. It’s as simple as a risk mitigation protocol, and as complex as integrating knowlege throughout the institution. Motivation or Engagement? What's the Difference? The hope from this module is that you will be able to understand some of the basic motivators of employees and management from a philosophical standpoint, as well as implement behavioral leadership techniques within the organization based upon the two main theories listed. There’s a lot of material here, and the cultivation of the material took years, don’t beat yourself up if you’re not a master overnight. Mastery is an asymptote. Expectations for your meeting is to journal some interaction with employees and understand where they stand by plotting your management style or interaction with them using the vertical dyads and the situational approach. the second expectation is to come up with one policy that will push down some decision to your employees using a metric similar to the examples given from YUM! foods and the company I worked for. You don’t have to implement the policy letter just yet, but let’s discuss something you could change in your business. What suggestions do you have to improve the module?